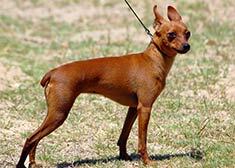 Miniature Pinschers, also known as Min-Pins, have compact muscular bodies with docked tails. This dog breed is best known for its high-stepping gait, total self-assurance and spirited animation. Miniature Pinschers, upstanding and alert, are loyal to their owners and make excellent companions. The Miniature Pinscher originated in Germany. Male Miniature Pinschers range from 10 inches to 12 inches. Female Miniature Pinschers range from 10 inches to 11 inches. Male Miniature Pinschers range from 8 to 10 pounds. Female Miniature Pinschers range from 8 to 9 pounds. Miniature Pinschers are typically black, brown or red. Miniature Pinschers have short, smooth and hard coats. Their coats require only occasional brushing to remove loose hair. The Miniature Pinscher is one of the most energetic breeds. Playful and brave, the Miniature Pinscher is described as a "big dog in a little dog's body." Min-Pins may be aggressive, but they are generally good with children and other house pets. 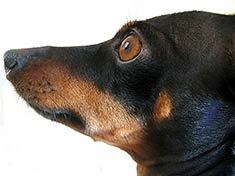 The Miniature Pinscher is susceptible to patella luxation and eye problems. The expected life span of the Miniature Pinscher is 12-14 years. Miniature Pinschers make adequate apartment dogs, but need sufficient amounts of exercise. A future owner of a Miniature Pinscher must also understand that this breed can be quite noisy. The Miniature Pinscher is in the Toy Group. Find Miniature Pinscher Puppies with our Free Breeder search!